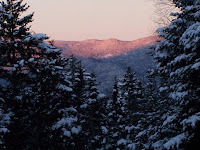 After a few days away from the Adirondacks and this blog, it is great to be back. The view driving up Route 73 through the Cascade Lakes never ceases to amaze me. Even when I haven't been in the city. This trip, however, involved the Big Apple and parts south and east where the spring bulbs are already blooming. Arriving back at one's home in the Adirondacks feels like starting vacation all over again. Before I left last week, I cross-country skied for two hours; one must prepare for these long car trips. I kept my fingers crossed the entire time in NYC in hopes the snow would hang on and be skiable upon my return. I went across the street after unpacking the car yesterday and the Olympic cross-country trails at Mount Van Hoevenberg delivered another incredible two hours of spring skiing. I'll post a more substantial blog later today, but I simply had to indulge my gratitude for this awesome lifestyle first thing this morning. Happy First Day of Spring in the Adirondacks!